An aneurysm is defined as an abnormal dilation/swelling of an artery. Any artery can be affected, however the most common artery to develop an aneurysm is the Aorta – this is the body’s major artery from the heart travelling through the body supplying all of the body’s organs including the arms and legs. An Abdominal Aortic Aneurysm (often referred to as a AAA or “triple A”) refers to an aneurysm occurring in the abdomen most commonly just below the renal (kidney) arteries but above the iliac (leg) arteries – see the diagram to the left. 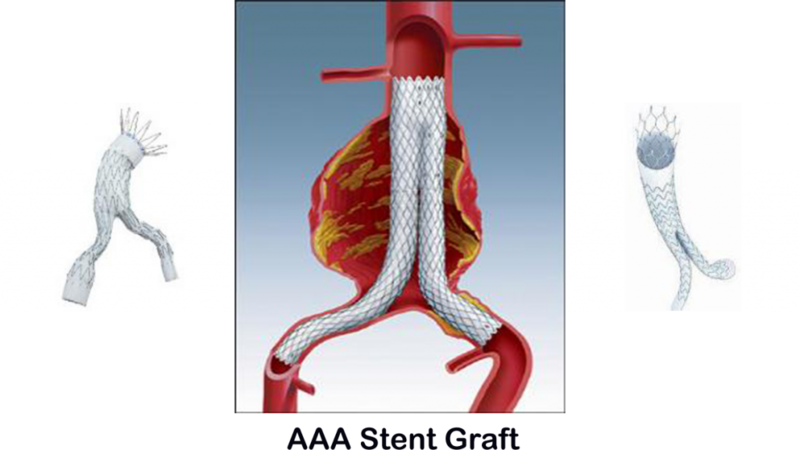 AAA can be a life-threatening condition and rupture of an aneurysm is fatal in up to 80% of cases. Therefore, an aneurysm needs to be treated when it reaches a dangerous size. Traditionally, an aneurysm repair required major abdominal surgery with a extended recovery including ICU. The good news is the majority of aneurysms can now be treated by re-lining the artery and excluding the aneurysm with “stent-graft” technology. This is a minimally-invasive or “key-hole” procedure that allows management of a life-threatening condition with no major incision. See the images below showing the placement of the stent-graft. This can all be achieved via two incision in the groin less than 1cm in size. New technology and surgical techniques can allow the “recreation” of the important arteries supplying the bowel, liver and kidneys – this is called a “fenestrated or brached endograft”. For more information on Aneurysm Disease call now!